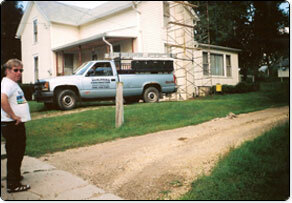 We are licensed and insured in WI, IA, and IL. We carry 3 Uniform Dwelling Code qualifiers in WI and are required to have 12 hours of continuing education. All of our employees are insured and covered by workman’s comp. We make sure our sub contactors are qualified, licensed, and carry insurance. Please take the time to view our slide show. While we may not be the cheapest estimate you receive, our experience and knowledge of many projects help us determine how much time, material, and structural strength and durability are required. We stress cleanliness and timeliness with every job we do. We also try to inconvenience you as little as possible. That means working around you and your family’s schedule. We also draw detailed plans of additions or other buildings that show elevations and finished results. 50 years of experience we are confident that we will exceed your expectations and we will be around to address any problems and future work. If you are building any size house or just need a storm door installed we will do it. No job is too small, no job is to difficult.